LONDON: Now you really can light up the room with your smile — thanks to a new trend for LED teeth that`s sweeping Japan. Japanese schoolgirls could be the driving force behind a new era of fashionable accessories for your teeth. Instead of gold, however, these "fronts" contain bright multicolored glowing LED lights. The mouth insert lights up when the wearer opens their mouth, providing a glowing smile, reports the Daily Mail. The LED teeth can even be controlled by a remote, which allows you to change the colour. 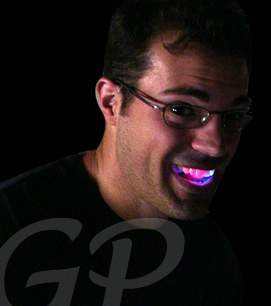 The LED smiles can easily be affixed to your teeth and glow different colors while you smile. The colors can be changed wirelessly through a computer interface. Of course they work best in the dark. The product is being advertised as a `party in your mouth`, and demand has gone through the roof. The new fashion accessories were originally created as an experiment by two Japanese designers and are now being used in a commercial advertising a winter sale at a Japanese clothing store, Laforet Harajuku. They are quickly becoming a sought after accessory. Motoi Ishibashi, one of the designers involved in the project, explained in a blog post that the original idea for the LED smiles came after he saw a video last year of LED Throwies, which are little lights that can be affixed to a magnet and thrown on metal surfaces. They are like lighted graffiti.